When I was growing up I loved my skateboard. I rode it almost every day along Whittier Blvd. past the shops, including the Chiropractor who had been there from before I was born. His office always intrigued me and I would often peek inside wondering what it would be like to be a Chiropractor. My sophomore year at La Habra High School was pivotal. That year we had the compulsory health class. The very first day my friend bet me lunch that he would get a higher score in the class. Well, I was up for the challenge since I already had a good knowledge of anatomy. After all was said and done I owed him a lunch even though we both got an A+. Now all this knowledge of human health had my wheels of excitement turning and so I finished High School with a lot of Biology under the belt. What I really wanted was to help people without drugs and surgery. In 1983, I was accepted to Fullerton State University and declared my major to be human Biology. My next big pivotal moment came when depression over my younger sister’s untimely death was hampering my grades and a well known professor, Dr. Miles McCarthy, called me to his office to ask me what was wrong. He helped me greatly and found out that what I really wanted was to help people, but I wanted to do that naturally. I already knew I did not want to get into the sickness model of drugs and surgery. He immediately said, “How bout Chiropractic?” Something told me he was right, something inside me felt this is what I was waiting for, someone to push me down the right path. In 1987, I was accepted to Los Angeles College of Chiropractic and my dream began to unfold before me. To say it was tough would be an understatement, but I pressed on. I quickly became interested in Radiology, Physiology, Neurology, Instrumentation and Athletic performance enhancement. I graduated in 1990 at the top of my class in clinical skills. I was the first student to complete my internship out of 170. Now I could work outside of school with other Doctors. I soon found the well known Dr. Reeves, who took me under her wing and showed me the ropes of caring for work and auto accident injuries. I quickly became well know for my ability to handle these kinds of cases and was getting great results. I loved it, but I knew something was missing. Ongoing training and education are so important to me. In 1992, I bought the practice and took it over solo. I enrolled in many educational seminars and to this day thrive on learning and staying on the cutting edge. Since then I have been fortunate to meet and train under many very well known Doctors and the worlds best health experts. I have learned that what I do was not by accident and that health is built into each one of us. We are God’s creation and that design is to be trusted and not overlooked. Slowly I have become a Wellness expert and I love very much the privilege of helping people this way, it truly is a joy. It is absolutely unbelievable that today I look through the window and see children skateboard past the same office I did over 30 years ago, only now I’m that Doctor. 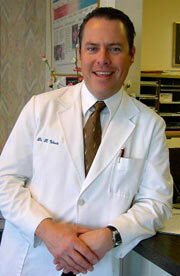 Dr. Woods is very active and leads a very congruent life with what he teaches and believes. He is an avid oenology authority and lecturer, a gourmet cook and organic food nut. He loves playing the piano, scuba diving, playing hockey and doing triathlons. Enough about me! Let’s get you some help today. Don’t wait! Contact Woods Chiropractic today to get started with care.